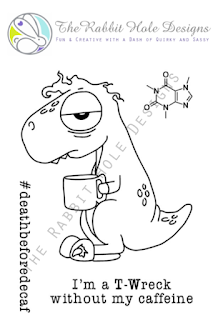 I hope you've been enjoying the sneaks you've been seeing from my Coffee Loving Teamies during the past week and yesterdays previews for the brand new stamp sets from the brand new stamp company, The Rabbit Hole Designs! 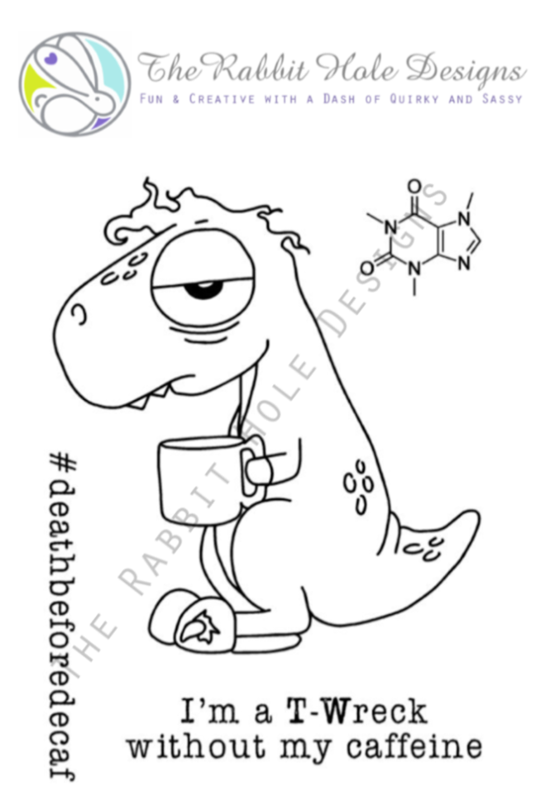 I think you're going to LOVE these fun new sets with a coffee twist! 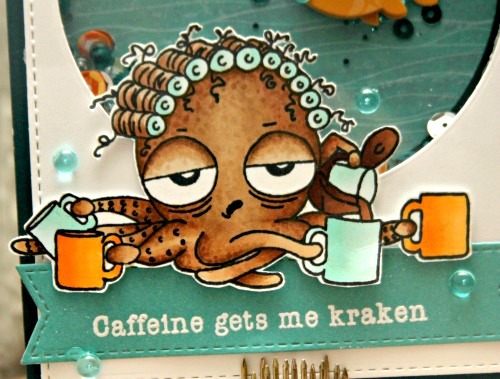 Adorable and fun images with awesome and fun sentiments! All of the new sets are available in the shop today! AND there's a special offer for you! You can get free shipping on orders over $15 before taxes and shipping from January 11th, 2019 through January 16th, 2019 (US orders only-some exclusions apply)! AND To celebrate day 2 of previews The Rabbit Hole Designs is giving away a stamp of choice from today's preview to TWO lucky winners. Leave a comment by 11:59 pm PST on January 18th for your chance to win. Winners will be chosen at random from the comments left on participating blogs, so make sure to visit each stop and leave a comment. 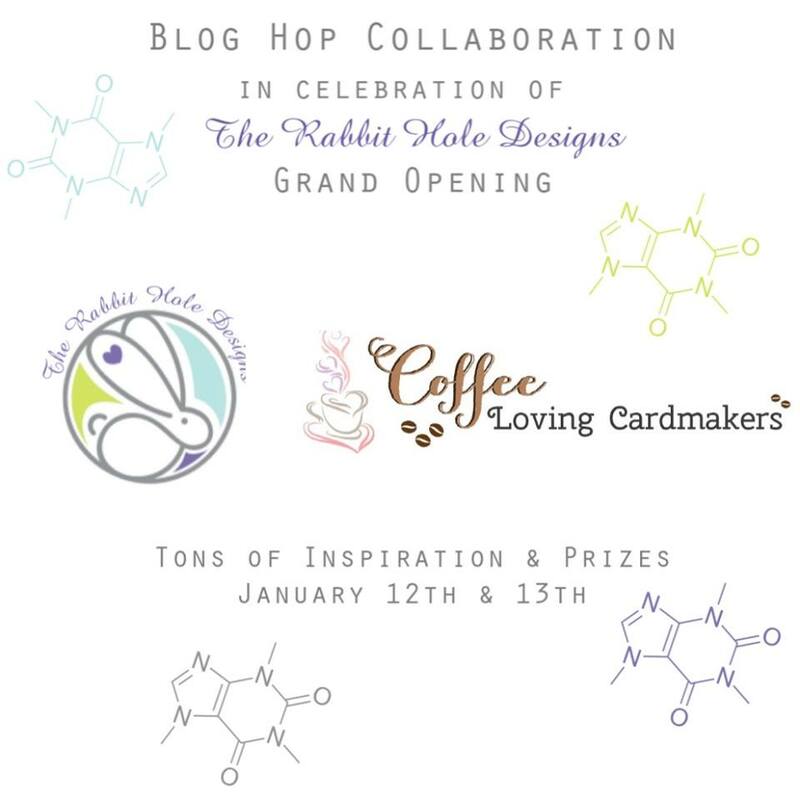 Winner's will be announced on The Rabbit Hole Designs blog and the Coffee Loving Cardmaker's blog on January 21st. And be sure to check out yesterdays posts too where you'll find more chances to win! 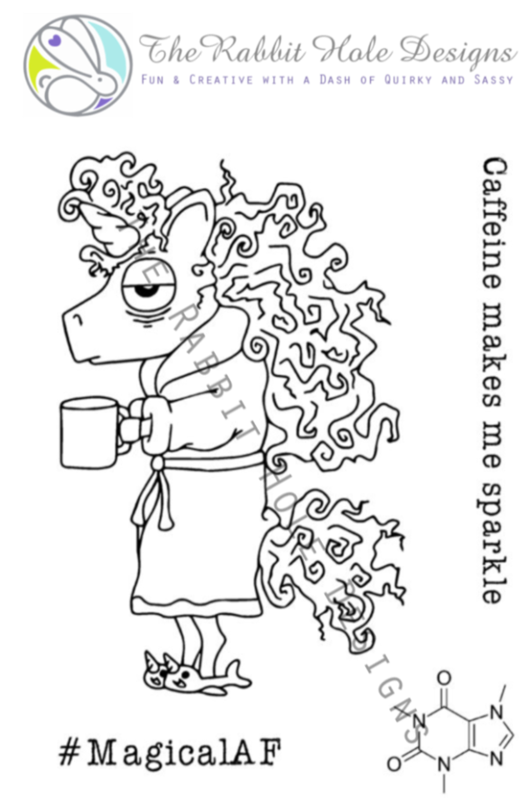 Today we're featuring some previews for the adorable Caffeinated Octopus and Caffeinated Unicorn stamp sets! 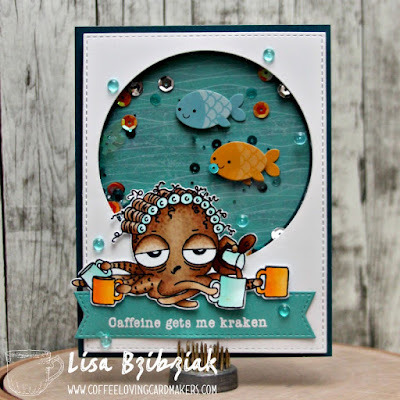 I was given the opportunity to play with the Caffeinated Octopus set and here's what I have for you today! Eep! So cute right?? 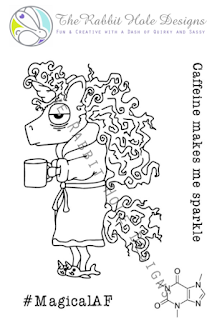 This little lady is really working at getting her day started...lol! 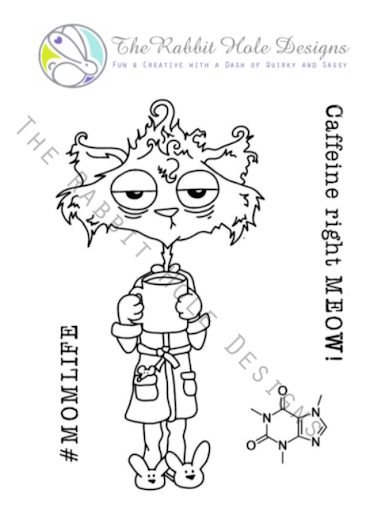 Each of these cute sets has an adorable image, a couple sentiments and an awesome stamp of the molecular structure of caffeine...lol! So cute, right?? Don't you just love the little details on this image??? Those curlers...lol! 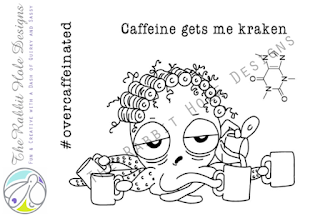 So that's me for today! 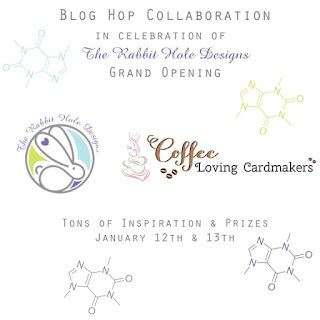 You should head on over to The Rabbit Hole Designs and check out what's going on! 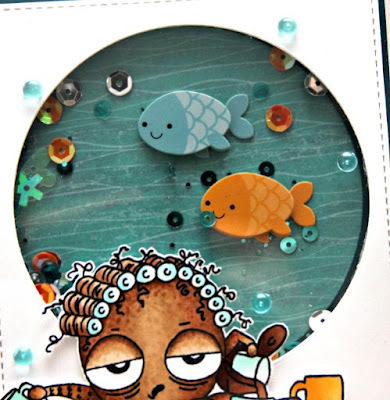 And since I'm using a new stamp set from a new stamp company, I'm linking up to the "New" challenge over at Cupcake Inspirations! For more inspiration, updates, and news make sure to check out these awesome places! Lisa WOWZERS!! you literally have given this stamp life. Your card is amazing! Thank you again for accepting the offer to share your talents in the launch of our company. LOVE the shaker card! LOVE the coloring! LOVE everything! LoveLoveLOVE this card!!! It's really amazing!! Oh my goodness! This is just too cool! I love your design and the coloring is fabulous!! Love love love love this! LOVING the ADORABLE curlers and that sentiment!!!!! I love a shaker card, and your design is fabulous! Your card just makes me laugh! Great design and coloring! 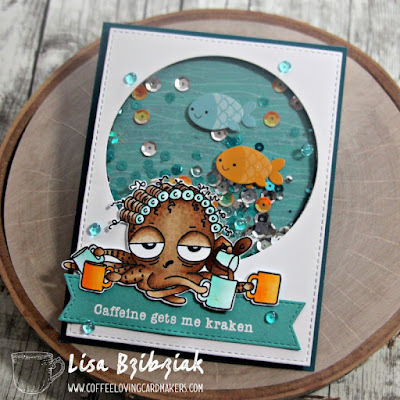 Oh Lisa this card is so cute and so fun! I love your design and coloring, those rollers just crack me up. I bet you had fun making this card! I love the sentiments on these stamp sets, and they are so cute and funny! Great card, you put it really well together! I so love your card! That octopus image is just fun and your card design is fantastic! I also love the color scheme! Have a great day! The images are fabulous and the sentiments are so spot-on. Just can't help but smile. This is Sooooo fun! I love the background and shaker element! You are awesome! What a cool card and so fun! I love that sentiment too! WOW, I love your design and your coloring is awesome. OMGosh this is beautifully constructed, got some caffeinated cuteness going on!! The stamp set are awesome! Your card is so Great! Made me smile for sure. Thank you so much for joining our challenge over at Cupcake Inspiration. What a delicious carts. I'm all about that. I'm in love with the scene you built too! Thanks for sharing . What a GREAT SCENE! I love your colors and coloring! What a fun card Lisa, it made me smile big in front of my screen. Like the whole look of the card. Lovely depth and detail! I think the embellishment is on point. Beautiful and fun card! Love this! You did an amazing job! So funny too! Just darling! Love the little under the sea world you created for her! You have made this image come alive! Super fun and oh so cute! Fantastic card! Love the shaker!! Oh my GOODNESS! This is too funny, I love that it is a shaker! Fun stamp sets! OMGosh this is so fun! I can't wait to get mine! Such a fun interactive card, Lisa. You are SO stinking creative. I would love to have you stop by and also link up your art with us at Word Art Wednesday. I always enjoy having you play along, and I hope you will join us again soon. Great prizes, lots of fun and I hope you will make it a "regular" to play along. I always enjoy seeing your art. Awesome card and love the colors! Oh my goodness Lisa! That card is just adorable! I love all of the stamps but I think the Octopus is my favorite! Your scene building is so cool, wow. 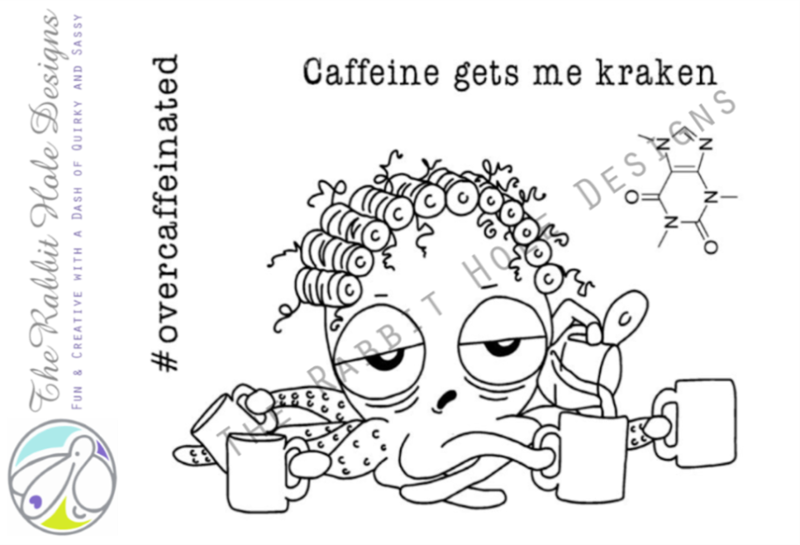 The kraken might be my fave! Love your card and your kraken jokes! :D beautiful ocean bg, too! This is an awesome card, Lisa! I love the octopus and the awesome round sea window too! Brilliant idea! Oh wow! This card is simply amazing!!! Love the design, the background and the stunning colouring!!! Love this shaker card and the color scheme you chose. The wide awake, good looking fish really show off her tired, bedgraggled look. Nice idea.